In the view from my workroom window I posted a month or two ago, you might just have been able to make out the faint blur that was the chalk escarpment, about two miles south of the village. This is a closer view. Look, it’s REALLY winter, or it was last week! Travel Chaos! 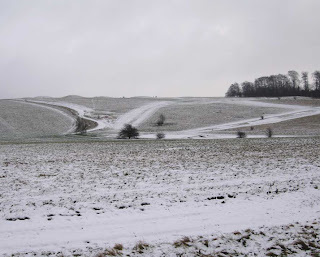 * The low mounds silhouetted on the skyline are barrows, mounds raised over burial sites. Most of these are Bronze Age (5,000-3,000 years ago), but one is Neolithic (over 5,000 years old). If you look closely, you can see people walking past the mounds, which gives a sense of scale. They’re big, even after 5,000-odd years of erosion. Barrows were often built on the highest ground visible from local settlements; no one today knows why. Perhaps people were comforted by the thought that their ancestors were keeping watch, or it may have been a territorial statement. Today the mounds are obstacles on a golf course. The trees to the right are beeches, often planted on chalk hillsides: their shallow root system copes reasonably well in the shallow soil that develops over chalk. Beech wood is lovely, often used for wood-turning, also known as ‘bodging’. Many Chiltern oakwoods were felled and re-planted with beech to support the chair-making industry… I was going to continue to describe the history and archaeology of the chalk, but I must get some work done! Some knitting content: I’m making progress on ‘Something Red’ in Sundara’s aran silky merino. It’s so soft! So perhaps it will block to an appropriate shape, and I hate tight sleeves anyway. The only way to find out what works is by finding out what doesn’t work. 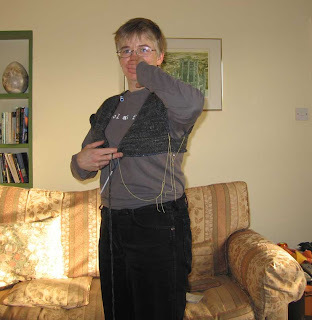 Which means knitting a few (if I’m lucky) tops that don’t quite fit. Oh, well. Doesn’t that sofa look inviting? The bit with the sun on it is my knitting seat; my ‘current’ knitting bag is just out of shot. I could wander back downstairs, settle in, and see what happens with that top. Or I could persevere with Seraphim^2. At the moment it looks like a giant woolly jellyfish, with c. 130st/quadrant, just about time to start the first pattern chart (I’m doing extra repeats to compensate for dropping needle size). Or I could cast on a pair of socks. It truly must be an addiction, because I desperately crave sock-knitting. I thought I’d love the speed with which aran yarn makes fabric; instead I miss the rows and rows and rows of tiny stitches on 2mm needles. I miss the changing colours, the developing patterns *sniff*. If I’m honest, I also miss the confidence I’ve developed. I can now knit socks that fit, but sweaters are a different matter. Of course this WILL change, once I’ve learned from a few mistakes. I just hope they’re not completely unwearable. *Only on the roads. This was ‘normal’ British snow, which falls from the sky in soggy lumps. A few years ago we had proper cold weather, complete with proper snow drifting on a knife-edged easterly wind. Complete Travel Chaos. A Network Rail spokesperson explained that this was ‘the wrong kind of snow’: the diesel train engines suffered from indigestion when the fine crystals were sucked into their air intakes. This entry was posted in Uncategorized on January 29, 2007 by sarahw. Of chalk and beech trees and barrows. An interesting post, indeed, Sarah. BTW, love the model shot. Seeing you laugh put me on the verge of giggles too. I now am absolutely sure that your “inner editor” is on overdrive when it comes to sweaters. Have you heard this term? The inner editor is the one that keeps you from writing before you even get a full sentence on the page. Lots of scribbling out and deleting. No actual progress on the writing front. Writing teachers are taught exercises to encourage students with overly busy inner editors to burst free and write a lot. Then, later, you help those students edit. So, to cheer you on…Just knit! Follow the pattern! Stop thinking so much, please…! When you’re done, you’ll have a sweater…and you can rip it out if you don’t like how it ended up! We like knitting, right? I loved the snow photo. It’s cold here today: 15 F, windchill 9, but no snow. Sally the short haired dog got to wear her very own winter sweater. Now that’s winter.